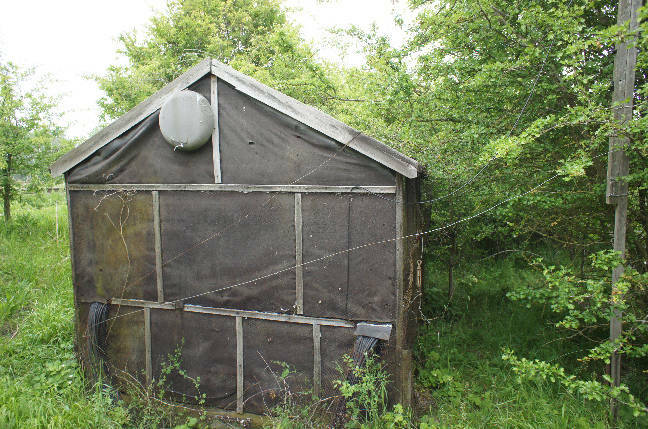 Geek's Guide to Britain A field full of bits of old wire and an abandoned garden shed: it doesn't look like the place where Nobel prize-wining research was conducted, pushing the frontier of radio astronomy. But it was. 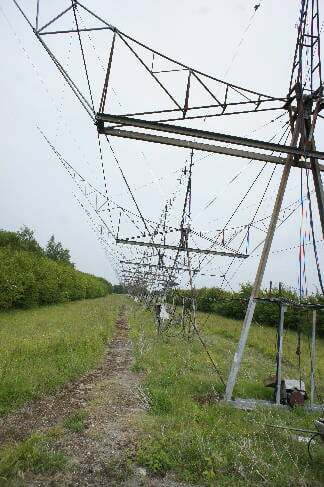 This is the Mullard Radio Astronomy Observatory, at Lords Bridge – site of a disused railway station just outside Cambridge – which is part of the University Of Cambridge Cavendish laboratory Astrophysics group. It was at Lords Bridge that physicists discovered pulsars, a breakthrough in our understanding of the Universe. Pulsars, or pulsating radio stars, are a type of neutron star. Neutron stars are very dense, small (typically about 20km in diameter), smooshed-together remnants of massive stars whose centres have collapsed after a supernova. They are subject to enormous gravitational pressure, so much so that their protons and electrons have combined to form neutrons, hence the name. A neutron star is considered a pulsar when it rotates at enormous speeds, emitting regular bursts of radio waves, X-rays and gamma rays from above its magnetic poles, producing streams of light which appear to "pulse" because of the rotation. Around 1,000 pulsars are now known to exist. Pulsars have since been employed by physicists trying to prove the existence of gravitational waves, as theorized by Albert Einstein. Physicists looked for proof of gravitational waves by judging the interference they might cause with the pulses emitted by millisecond pulsars. In the end, gravitational waves were proved to exist using other means. Pulsars have been used in the hunt for extrasolar planets – planets orbiting stars other than our Sun. Scientists in 1992 found three planets circling a pulsar called PSR B1257+12. Evidence suggests such planets are are created by the debris blown off the surface of the dying star before it collapses. And some believe that because of their fixed location and their regular blips, spacecraft could navigate using pulsars as a kind of compass or GPS. The European Space Agency (ESA) in 2012 commissioned Geek's Guide destination the National Physical Laboratory (NPL) and Leicester University to investigate the feasibility of using pulsars to navigate in deep space. Whether this is feasible is another matter. But, here we are. With a hut. In a field. It’s about as far from the cathedral of science as somewhere like the Large Hadron Collider as its possible to get. It looks like a very old set of Doctor Who: open fields, pen recorders and the lingering fear of unexploded bombs. I’ll come back to that. I’m here as a guest of Cambridge Wireless’ Heritage SIG and my guide is Peter Doherty, who for the last 17 years has been building equipment at the site. Steeped in the history and with a passion as much for the history of endeavour as for the discovery of the unknown, Doherty is one of those people whose infectious enthusiasm comes from being a person who clearly enjoys his job. And this must be a pre-requisite for working at Lords Bridge, which was a station on the Varsity line, the train service between Oxford and Cambridge shut down in 1967. But there are some more ominous ghosts in this past. The whole reason the site became available to the University of Cambridge is that during the World War II it was a bomb dump, storing high explosives and mustard gas for distribution to the local British and American airfields. One of four secret Forward Filling Stations, it had stored 2,000 tones of explosives, including two 250-tonne containers of mustard gas. Many thousands of tonnes of gas were made at the site. It was deemed too unsafe for general use, and so was given to the University. After the WWII, the chemical weapons, which Britain officially never had, proved hard to destroy. In an accident in 1955, a tank of 20 tonnes of gas exploded when a worker on top was careless with a blowtorch. The accident report says there were no casualties, but a couple of rescuers were awarded medals, so it’s unlikely that it was quite as minor as you’d be led to believe from the reports of the time. Eventually the munitions were loaded into ships that were deliberately sunk at sea. Since the war, the odd shell has been turned up and it’s unlikely that the site is now completely clear. This has been a boon for the local wildlife and for the radio astronomers of the University Of Cambridge. The war, however, had a second, more positive affect: the introduction of radar, which helped advance radio astronomy. Radar is credited with helping turn the Battle of Britain by giving the RAF time to scramble and intercept the Hitler’s Luftwaffe. But for all that glory, there did exist technical issues and work was needed to filter out unwanted, extra-terrestrial signals from radar reception. The problems of interference were highlighted when radar failed to spot three German battleships during one incident. At the time this was blamed on German jamming but subsequently turned out to be Sun spot activity. Research on which frequencies and where signals came from became very important. Enter Nobel Prize winner Martin Ryle, of the Radio Astronomy group of the Cavendish Laboratory of the University of Cambridge – Cavendish was opened in 1874 under the direction of another Geek’s Guide to Britain notable, James Clerk Maxwell. After a brief stint at Cavendish’s ionospheric research group, Ryle worked on the development of radar during WWII for the RAF. After the war, at Cambridge, Ryle investigated the effect of radio emissions from the Sun that were interfering with radar equipment.